It's been a long while since the last time I featured a celebrity house in this blog. I think the last one that I featured here was the condo unit of Jake Cuenca. Now, I want to feature another celebrity house, it's no no less than the house of famous heart throb Sam Milby. I actually able to watch this episode on Boy Abunda's show and it really fascinates me how grand and unique Sam Milby's house is. Without further ado, let's take a peek on Sam's lovely abode. Screen shots from ABS-CBN's Kris TV. 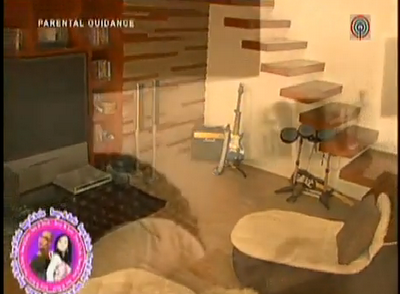 Yes Aileen, napaka spacious talaga ng house ni Sam at very neat. Meron din syang mga secret doors sa house nya leading to some rooms na talagang di mo mahahalata. Nice talaga! Ang ganda ng house! I love the stairs, yun fave ko! And yeah, super nice yung stairs.